Buy shoes on a better price! PRICE: The price you see on the product page is a base price - check the final price after you choose the product parameters. Each product have some variations - size, symbol, additonal product characteristrics that change the final price. Sizes EU 35 to 39. Genuine leather & leather lining. Vibram® Superflex rubber sole. Sizes: EU 35 to 41. 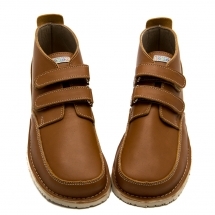 Comfortable, light-weight and soft Mary Jane shoes hand made from a genuine leather. Appropriate for intensive and fast walking outside, in the office. Sole: Vibram rubber material - very soft, elastic and light-weight. Sizes EU 35 to 39. Genuine waterproof leather & leather lining. Vibram® Superflex rubber sole. Indoor moccasins with velcro strap fastening. Sizes EU 18/19 - 30/31. Genuine suede leather & rubber sole. Sizes EU 21/22 to 34. Genuine leather & leather lining. Vibram® Superflex rubber sole. Indoor slippers with velcro fastening. Sizes EU 16/17 - 24. Genuine suede leather & rubber sole. Light, easy to slip on. Shoes in sizes EU 25/26 - 36. Genuine leather & leather lining. Vibram® rubber sole. Appropriate for long-lasting walking and playing outdoors.